Camping and grilling go hand in hand. You can always smell if someone is grilling at the campground, and I’m one of those that love the smell. Today I want to encourage you to cook more of your meals outdoors, and I’m going to help you find the right tools to do it. I love cooking outside, and somehow the food always ends up tasting better. With propane grills, it has become effortless to cook a steak out in nature with close to no cleanup afterward. As we’ll see today, portable grills can do everything bigger grills can, where the only noticeable difference is the grilling area, how much you can grill at once. But even though they’re so portable and easy to set up, they’ve features you would only expect from more expensive high-end grills. Grilling used to be something that my family would do on Fridays to celebrate that the weekend had arrived. Nowadays, my wife and I grill several times a week. With propane, we don’t have to wait for charcoal to get ready, we can fire up the grill, wait a few minutes, and then throw our food on. When done, brush it off, and that’s it. It often creates fewer dishes compared to cooking in the trailer, so why not do it as much as possible? Some people say propane grills make the food taste like propane and there’s no way they’re going to grill if it’s not with charcoal, but in my experience, a good propane grill doesn’t flavor the food at all. I have picked five grills today that will do the job. Paying more gives you more BTUs and better build quality, but it’s okay to start small to get into grilling and upgrade later when you’ve fallen in love with the food and ease of use. The first grill we’re looking at is from Coleman. The Fold N Go is the smallest grill in today’s comparison in every department, but don’t let that discourage you. The 105 square inch grilling surface will be enough for at least two people, and the big selling point of this grill is the portability. If you don’t plan on grilling every week and want to have a grill that doesn’t take up a lot of space in your storage but will do the job when needed, this could be the one for you. Attach a 1 lb propane cylinder and fire the grill up with a long lighter and you’re ready to go. The adjustable horseshoe burner has temperature control depending on what you’re cooking. When done grilling, cleanup is easy. Just remove the cooking surface and grease tray. I recommend just scrubbing the surface down a bit and collect the food particles that fall underneath it. Fold it down when it has cooled, pick it up by its built-in handle and stash it away, and that’s what I call easy cooking. What I would’ve liked to see on top is a temperature gauge to know when the grill is ready. If you want one, you can add one like this from Dozyant on your own with a ¼ drill bit. I recommend this grill for the couple that only grill on occasion and don’t have a lot of storage. 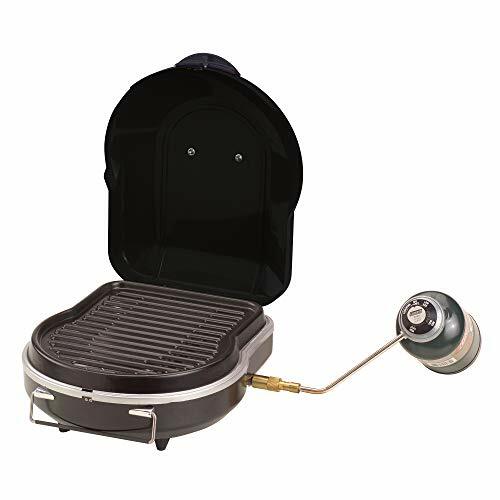 It’s light, very portable, and has the functionality you want from a small propane grill. Smoke Hollow is a company that’s popular for its big smokers, but they also make a couple of smaller grills. This model number 205 is a tabletop propane grill that has a cool design. It’s the only grill in today’s comparison that has a warming rack above the grill which is a neat feature. The primary cooking area is 205 square inch while the warming rack is 105 square inch. A warming rack is a good place to put the food that is done cooking, but you want to keep warm until it’s time to eat. It’s also great for heating buns that you don’t want to put directly on the searing hot grilling area. The legs on the Smoke Hollow 205 are foldable and underneath you will find a stainless steel drip tray. There is one big burner inside, and it burns up to 10,000 BTU. On top, you will find a temperature gauge that will tell you how warm the grill is inside without opening the lid. On the side, there’s a push ignition button for an easy-start. The big lid will lock in place while not in use. Most grills are made for 1 lb propane fuel cylinders but note that it’s not limited to the use of those. You can buy a hose and an adapter to using a bigger propane tank or the quick connect found on newer RV’s. Down in the FAQ, I’ll share my other favorite grilling accessories. So with twice the cooking area, warming rack, thermometer, ignition button, and 10,000 BTU, this is a step up from the Fold N Go. If you’re cooking for more than two people, I recommend this over the Coleman. Remember to check the measurements to realize the size of it. The price for the most stylish-looking grill today goes to the CGG-750 from Cuisinart. Honestly, it doesn’t even look like a grill until you set it up. This neat little set comes with a bottom that has a place for a 1 lb propane cylinder, a middle part that is a grill with a 154 square inch cooking area, and a top made out of wood that sits on the grill as a lid. The top also functions as a cutting board. When it’s time to grill you remove the top, pull out the grill and connect the 1 lb propane, then ignite the grill with the twist-start ignition. Note that no lid goes over your food while it’s cooking, so you won’t reach the same temperature as with a lid-style grill. To combat that, you could use a melting dome like this one from Bellemain . I often use a melting dome to melt the cheese on my burgers. A melting dome also limits the cleanup. The Cuisinart CGG-750 Venture has a 9,000 BTU burner, and with its 154 square inch cooking area, it sits between the Coleman Fold N Go and the Smoke Hollow 205. 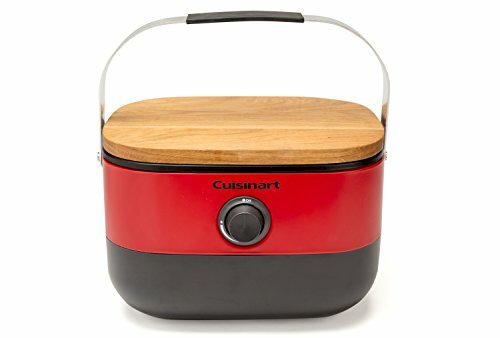 Note that it’s the same weight as the Smoke Hollow, even though the cooking area is about 28 percent smaller on the Cuisinart. I have to say that I like the design of this grill. The handle on top will make it easy to carry around with you, and the compact design makes it easy to store in a small place. I do wish the bottom would’ve been made out of something other than plastic so it could be used as a lid during cooking. It also doesn’t offer a temperature gauge due to its design. Napoleon is a company that focuses on grills, which becomes clear when you take a look at the TQ285-BL. The amount of features they’ve been able to fit in this little portable grill is astonishing. It has the biggest cooking area at 285 square inches, heated by its two burners that make sure your food gets grilled evenly. It has a twist-start ignition system that Napoleon calls Jetfire due to how fast it lights up. A stainless steel tray on the bottom takes care of grease that drips down during cooking. An Accu-Probe temperature gauge on top of the grill will show when it’s hot enough to smoke, bake, roast or sear your food. Napoleon takes the next step when it comes to portability, letting you fold in the legs to make it easier to store. The locking lid won’t move during travel, and the grill is easy to set up when you’re ready to cook. So who is the Napoleon TQ285-BL for? 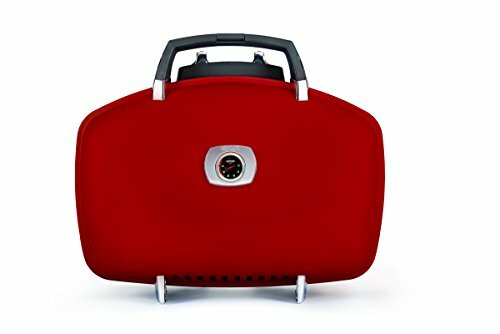 It’s for the bigger family or grill enthusiasts that want the top of the line portable propane grill. It packs a lot of features in a compact design. Two burners, biggest cooking area in today’s comparison, up to 12,000 BTU and weighs less than the Weber Q2200. It has everything you need. The last grill today comes from the most popular grill company there is, Weber. You might’ve seen it on my Ultimate RV Kitchen Accessories List, and it’s the grill that I own and use. It offers a slightly smaller grilling area compared to the Napoleon, at 280 square inches. One burner produces up to 12,000 BTU, and in my experience, it heats the food evenly. Weber has put an easy-start electronic ignition on this model that requires a battery to operate. The ignition has worked great for me, and I never use a lighter anymore to light the grill. To take care of grease, you can purchase drip pans from Weber or just put something underneath the grill to catch the grease. I use aluminum foil formed to the shape of the drip pan and throw it away after it has cooled down. Folding side tables sit on each side of the grill, for me they’ve been handy when I’ve put the grill on small tables. It’s nice to have somewhere to put your tools and the food before, during, and after cooking. A temperature gauge on top will let you know when the grill has reached specific temperatures and the lid does a good job at keeping the heat in. At almost 44 pounds, the Weber Q2200 is the heaviest grill in today’s comparison. It hasn’t been an issue for me as the handles on the side are sturdy enough to where I can carry this around with ease. Well, I’m definitely having grilled food for dinner tonight. I hope I’ve helped you through the grill-jungle and that you feel more confident about what you need. If you buy a grill and end up not having a good experience, don’t give up. It takes time and a good grill to get good at it, and you’ll get to know your grill with time and be able to cook up wonderful dinners. If you’re looking for grill accessories, scroll down to the FAQ where I share my favorites. Good: Smoke Hollow 205 – Smoke Hollow makes quality products, this grill is no exception. Foldable legs, big cooking area with a big warming rack above it, and 10,000 BTU burner makes this a great grill. Better: Weber Q2200 – The Weber Q2200 is a great grill that does a lot of things right. With a big cooking area, 12,000 BTU burner, and built-in tables, it’s a beast of a grill. It has some weight to it but it’s still portable due to the sturdy handles. 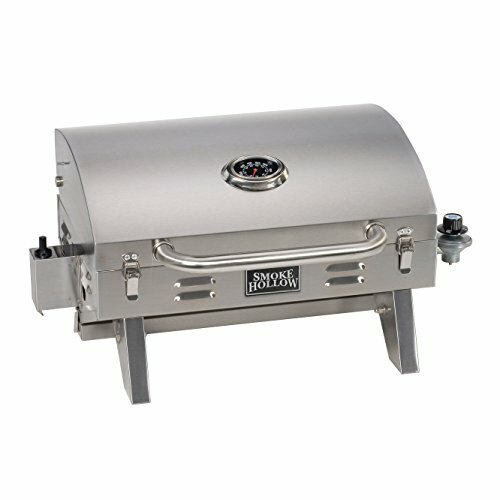 Best: Napoleon TQ285 – The Napoleon TQ285-BL is the grill to beat right now. In a portable package, you’ll get all the features you’d expect from a high-end grill, and this is one you can bring with you everywhere. The 285 square inch cooking area heated evenly by two burners will make lovely dinners and is so travel-friendly that you’ll want to use it every day. What are the best grilling accessories? Propane Hose: DOZYANT Propane Adapter – The first thing I purchased after buying a grill was an adapter so I could use bigger propane tanks than the small 1 lb cylinders. This one is 4 feet, long but they’re available in longer lengths as well. Tool Set: Grillaholics 4-Piece Stainless Steel Tool Set – In my world, you don’t need a case full of grilling tools. You need a spatula, tongs, fork and a brush. I’ve been grilling for years and have never felt like I’m missing something. This heavy duty 4-piece set from Grillaholics will last you a long time and do the job. Food Thermometer: ThermoPro TP-16 – When cooking chicken or pork, you must make sure the food is cooked thoroughly. I do that with this neat digital thermometer that will not only tell you the temperature but also what recommended temperature your most common meats must reach to be safe to eat. Melting Dome: Bellemain Stainless Steel Melting Dome– If you want to melt the cheese on your hamburger, or force a lot of heat to stick around your steak, this dome will do the job. It works excellent on griddles and grills. Grill Press: Lodge Rectangular Cast Iron Grill Press– Another neat tool I use on top of the grill and griddles is this cast iron press made by Lodge. Not only does it do a good job at flattening burgers, but it also helps the food cook faster when I place it on top of it after letting it heat up on the grill. Grill Brush: Grillart Grill Brush And Scraper – I only use one thing to clean my grill, and it’s this grill brush and scraper made by Grillart. I can clean both the grilling area and the inside of the grill with this in just a few minutes. If you’ve bought grill brushes that haven’t worked very good, you need to try this one. When I clean my grill, I use the Grillart Grill Brush And Scraper to scrape off burnt food inside the grill. I usually leave the grill grate dirty to keep it protected from rust, but not for too long. I tend to clean it every three months. It’s more important to me to make sure that the burners are clean by wiping it down with a damp sponge. When I end up having to clean the grates, I scrub it down while warm with the brush, and it’s often enough to get it clean. The fact is that I clean the outside of my grill more often than the inside. The outside gets clean with some soap and water. Can I use a propane grill indoors? No, don’t do that. The burned propane gas releases deadly carbon monoxide at a much faster rate than your gas stove in an RV. Is it bad for your health to grill with propane or charcoal? Grilling with propane is better for you than charcoal. When you cook meat and fat drips down and burns, it creates PAH-infused smoke, which then coats what you’re cooking. Since charcoal produces more smoke than propane, you end up with more carcinogens like PAH (polycyclic aromatic hydrocarbons) in your food. There are ways around it, cutting off most of the fat on your meats will reduce the amount of PAH. Marinating your meat in vinegar or lemon juice also helps, it reduces HCAs which is another carcinogens, by up to 90 percent.